While travel has innumberable benefits, one of the greatest is perspective. When you see how others live and the challenges they face, you can better understand your place in the world. Although I’ve visited many places, I’ve never found a better place to learn perspective than in India. I’ve always said that I wish all Americans could spend just a few hours in India so they could realize how blessed most Americans are. Shanna’s father is involved with an organization called CRY, a non-profit whose primary goal is to provide education to children in India who would otherwise go without. CRY has projects throughout India, including several in Delhi. Using his contacts, Shanna’s father organized a trip to one such project for me, Shanna and her parents. 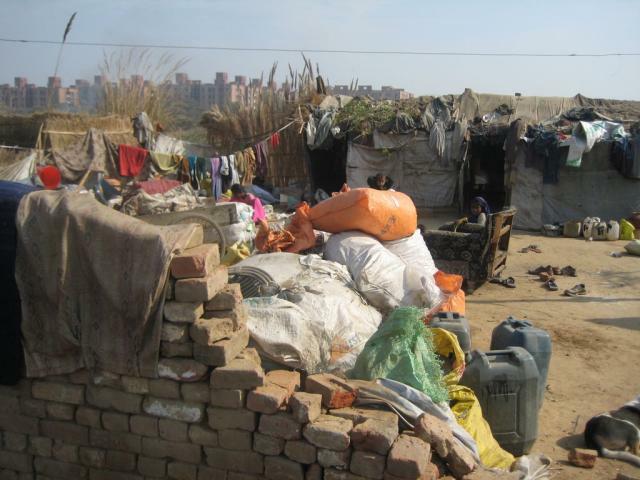 Quickly after turning off a main road outside Delhi, we came upon a slum area like nothing I’ve ever seen. The ground was a dry, dusty dirt that looked as if it hadn’t seen water in years, and the “homes” were makeshift tents that had been built with scraps found in the garbage dump located a few hundred yards away. As we walked through the village, we were swarmed by children and intrigued adults whose clothes were mostly ripped and filthy dirty. Many of the children were without clothes at all, and shoes were a luxury in which few had the means to indulge. Our hearts sank. The representatives of CRY, including one of the teachers from the village, led us around this village and two others within walking distance. The villages are mostly made up of nomadic people who have left their prior homes and made their way to Delhi in search of a better life. If this way of life is any improvement to their prior one, I can’t even begin to picture what that one must have been like. The villagers spend their days attempting to make money any way they can, including “ragpicking,” where they sift through the garbage left at the dump next to the village in hopes of finding anything of value. In a perverse manner of environmental service, much of their success in ragpicking includes finding and selling recyclable goods (such as plastic water bottles). The remainder of their time is consumed with basic survival, including the daily carrying of water jug by jug from a nearby water source with – to say the least – questionable sanitation levels. In these villages, where basic needs are barely met, education of children is an afterthought. Many of the children start trying to earn money for their families – including by way of begging – soon after they’re able to walk. In some cases, parents have to be convinced that education is a valuable use of their child’s time. After all, every hour in school is another hour where money is not made (and food purchased with that money is not put on the table). With its funds, CRY has set up schools in each of the three villages we visited. In one case, the school met under a tent; in the other two, children learned in a windowless stone hut. Noticeably absent were any of the items you see in most classrooms in America: no computers (you need electricity for that…), no chairs and no desks. Some of the children simply had a small chalkboard and a piece of chalk – we were told that this was preferred to pencils and paper because a constant supply of paper would be cost-prohibitive. Even with these seemingly insurmountable hurdles, the smiles on the children’s faces were impossibly big. They took turns singing us songs they had learned in school, most of which were laden with inspirational lyrics. Shanna’s mom, a pre-school teacher in Michigan, taught a few songs to the children. They were quick learners and seemed starved for interaction. As we made our way out of the village, we passed by one of the classrooms where the children were sitting outside in a circle (on the dirt, of course) and playing a modifed version of duck, duck, goose – a playful escape from their dim reality. 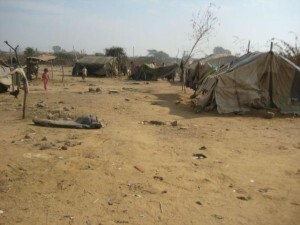 We all came away from the experience with deep appreciation for the life we have at home, sadness for the inhabitants of these villages, disbelief that this can exist just a few miles from the opulence that exists in parts of Delhi, guilt for the excesses of our lives and resolve to support organizations like CRY.